A while back I wrote a longer piece on how to design a market system within the game Pokemon Go, and what aspects that I think will determine what the effects will be when the update comes. In this second blog post about economics related to the game I discuss how society in pokemon universe would be like. And what could be an awesome way to development the game further! Let’s imagine living in a world with pokemons, very intelligent animal-like creatures with sort of super power. It does not appear to me why having them fighting each other would be such a huge thing in this world as the pokemon games make it appear. Sure there are humans forcing animals fight each other for our entertainment in our society too. But one can hardly claim it’s a big thing in the developed parts of the world. Since pokemons are intelligent enough to understand human spoken language and express emotions I doubt the practice of having pokemons fight to exhaustion or death wouldn’t engage movements fighting for pokemon rights. From an economic standpoint there is a lot to gain from trade with pokemons, trade defined as voluntary transactions from both parties. Or if the enslavement would persist: having them do more productive tasks. The pokemons might lack the intelligence to comprehend the concept of trade, like most animals in our world. In any case, there might not be any moral reason to treat pokemons differently than we treat other animals, as property. We see in the pokemon movies and tv-series that there actually are a lot of work that can be done by pokemons. For example there are pokemons who work as nurses in hospitals, assists with transportation services and deliver mail. Since a lot of pokemons possess supernatural abilities such as being able to create fire, electricity or poison etc. there is in fact big gains in employing pokemons to stuff that humans can’t do or do at a high cost. Perhaps my observation sounds obvious, so let’s go into how employment for pokemons could create an interesting dynamic element in Pokemon GO. In the game there are places called Pokestops where players can receive free items such as pokemon balls and medicines. Instead of giving out these items for free, imagine these depots instead offered players quests to complete in exchange for items. 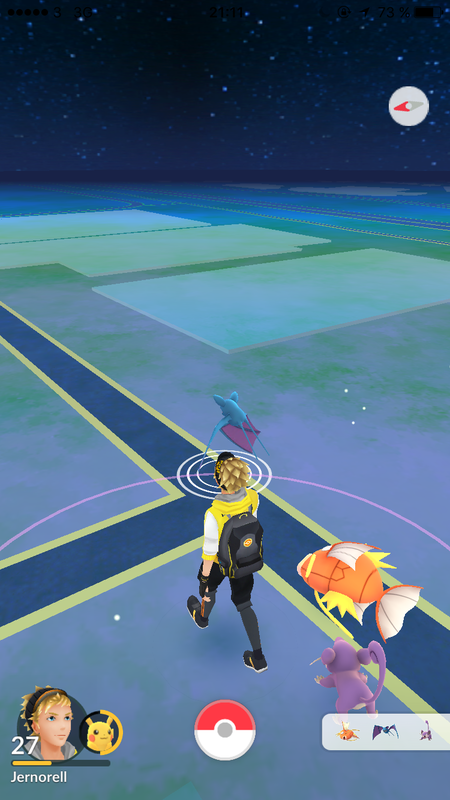 Perhaps at a poke stop, the player meets a human asking for help with a task, say, building a wall or fishing for food. The player can then lend one of it’s pokemons to the person in need for an amount of time. Building a wall or carrying heavy thing might call for a strong pokemon while for fishing you might want to employ a water pokemon. Depending on how skilled and fitted for the task the pokemon is, the player is paid accordingly. This would give players a reason to gather good pokemons of different elements and with different abilities. 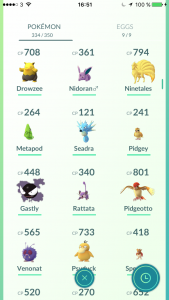 As the game looks today, the only reason to gather strong pokemons is to build a strong compating team, and for that task there really is only a handful of pokemons that are really valuable. I would say this is a fairly simple element that would make the game more dynamic and interesting for the players. Hopefully some game developer from niantic sees this post and makes it reality. In this text I write about different aspects that will determine the success of introducing a system of trade between players in Pokémon GO and the effects from it. I write this text from an economic perspective, and not the perspective of a game designer. This will influence what theories I use in the analysis. If you have any objections, questions or other feedback, please comment on this post or sent me a message! I want to it make clear that this text is about what effects we can expect within the game from players being able to trade virtual commodities. To express it differently, the focus is not about effects outside the game or about people spending real money. 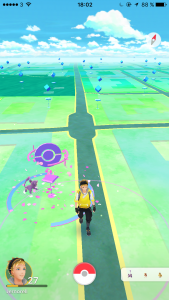 Pokémon GO is a game that became a social movement the summer of 2016. People from all social classes and from all generations get together to share the experience both in real life and on online social platforms. This is despite the fact that the game has with very limited opportunities for interaction between players. One way to create this opportunity for interaction, making the game less of a single-player game is to make trade possible between players. 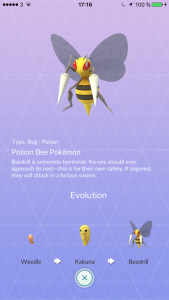 This is something that Niantic CEO John Hanke has hinted is coming in a future update of the game, calling it “kind of a core element” in an interview. When analysing how the introduction of markets to Pokémon GO would affect the gaming experience for the players, there are some things worth having in mind. What will be traded? Between whom will it be possible to trade? And how will the trade be executed? These are some questions I will be discussing in this text. What’s the goal of the game? 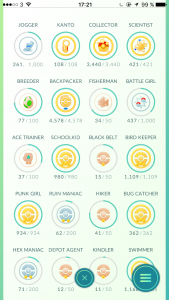 Getting a high trainer level is done by playing the game a lot. A players trainer level is determined by their XP-count, which raises by doing activities like catching pokémons and battling at gyms. There are 151 different kinds of pokémons, and of course you want to “catch ‘em all”. Or at least having caught more than your friends have. To fight other trainers at gyms, you need at least a handful of strong pokémons. Comparing your strongest pokémons is therefore one way to determine who’s the better pokémon trainer. In perhaps limited degree players compare things such as total number of pokémons caught, total miles walked etc. So why is this important? Well, when discussing how the introduction of a market system will affect the gaming experience it’s good to have some measure of what the gaming experience consists of. In the pursuit of the objectives mentioned above, the game must be balanced so that players feel it is both challenging and rewarding. If the game becomes “too hard” or “too easy”, people will get bored. Might a market make some goals too easily reached? What restrictions to the markets system might be implemented to solve these issues? What is going to be traded in this market? Firstly, trade requires that ownership is clearly defined. 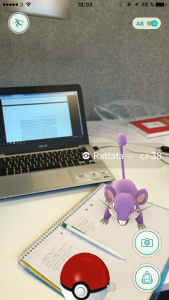 In a game environment like Pokémon Go, it is very easy for the developer to establish institutions for ownership. So what things can players get ownership of? Most obvious is that players can own pokémons. Players acquire ownership of Pokémons simply by catching them with Poké balls. Pokémon candy is used to evolve and strengthen pokémons. Every pokémon has their own kind of candy, of which you get 3 pieces when you catch a pokémon, and a fourth if you choose to discard it (“transfer the pokémon to professor Oak”). Pokéstops are places in the map where players can collect items such as eggs, poké balls and medicines which are helpful in the game. Some special items are bought in the shop in exchange for pokécoins (the Pokémon GO-currency) or rewarded players when they level up in the game. Examples of these are “luremodules”, “incenses” and egg incubators. There are kinds of ownership that doesn’t show up in any player inventory but still possibly could be subject of trade. I’m thinking of the temporary position as a gym leader, stardust and trainer XP etc. To be honest I don’t believe this kind of market would be the first one to establish, I will not discuss this in great detail. The first two categories I think are the most interesting ones and would result in the biggest change to the game, why I will focus on them. Players today have the option to save the pokémons they catch or to transfer them to professor Oak in exchange of candy. Most pokémons that players catch are transferred immediately since you don’t have much use of doublets and triplets of the same type of pokémon if it’s not strong enough to qualify in your gym-competing line-up. With a market of pokémons would come the option to sell excess pokémons to other players. If they would be able to get more from selling the pokémon than from transferring it (which gives one pokémon candy), they will choose to do so and earn a profit. When a player increases their trainer level, the pokémons they find will be stronger and stronger. This means that trainers of high level would supply the market with very strong pokémons relative to the ones that trainers of low level would. If there is no mechanism for restricting low level pokémon trainer from getting their hands on these strong pokémons then the playing field quickly would even out between low and high level trainers at gym-battles. This is not necessarily a bad thing. But it could disrupt the balance of the objective to get a good gym-competing line-up (C) since you will accuire a strong team of pokémons early in the game which won’t evolve much over time. This could be solved by only allowing trade between players with fairly similar trainer level or (perhaps more likely) that the strength of the pokémon (measured in combat power, CP) will be reduced when sold to a player of lower trainer level. It is also possible to anticipate that the quest to “catch ‘em all” (B) suddenly would be much easier, perhaps “too” easy. New players would be able to buy almost all pokémons in the matter of days. One way to cope with this is to only allow players to buy the kinds of pokémons that they already have caught before. Basically a market of pokémons would even out the playing field between players of different levels. One way to cope with all these issues could be to instead of creating a market for trading pokémons, creating a market of pokémon candy. A market of pokémon candy doesn’t risk disrupting the balances of the objectives being both challenging and rewarding. But it would still bring the social element of interaction between players and allow differentiation between players. Let me explain that further because this would be the most striking change to the game if a market would be introduced. Trade makes specialization possible. A player could use the market to specialize in a specific type of pokémon, such as water pokémons or fire pokémons. Why you might ask? Well it would allow players to be free to develop their own playing style and let people feel unique. 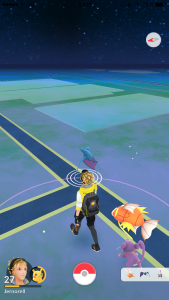 As the game is today, besides choosing your team, changing the clothing of your avatar and choosing a “buddy pokémon”, there is not really much you can do to specialize and be unique. Some Pokémons are clearly stronger in gym-battles than others, so you might ask: why would anyone sell the good ones? Because people have different preferences and different objectives. Someone who wants a strong line-up would want to buy for example a dragonite. Another player might seek to level up their trainer level, for them it would make more sense to sell their dratini candy for a lot of pidgey candys and use them to evolve quickly. If prices are allowed to change freely it will adjust so that people get along. This might result in the relative price to be set at 200 pidgey candy = 1 dratini candy. It depends on people’s preferences. If prices however not would be allowed to change according to changes in supply/demand, we would see shortages, where players who are willing to pay a higher price wouldn’t find the candy they are looking for. Between whom will trade be possible? The degree to which a market system could possibly disrupt the balance of the game objectives depend on the scope of the trading. Will there be a global market that allows you to trade with anyone in the world, or will it be a local market that only allows you to trade with players that are close by? A local market would be more consistent with the original pokémon game for gameboy, so it’s likely that this is how Niantic will design the market. But how would it be different from a global market? A local market makes trade more difficult, it increases “transaction costs” in economics lingo. Especially in sparsely populated areas where the number of players to trade with is limited. This would increase the difference in gaming experience between people living in rural and urban areas. Which is already big due to the difference in the number of pokéstops and gyms in cities compared to rural areas. One way to balance this could be to restrict trade only to say the 100 closest players instead of say anyone within 100 meters. Another difference is that with local markets the prices would differ a lot more. For example in places with lakes where it’s easier to find water pokémons, water pokémons would then be cheaper relative to other types. In a local market, the supply and demand would shift depending on which people are close to you, this would mean increased uncertainty when it comes to prices. In contrast, at the other extreme with a global market the relative prices would be much more stable so it would be easier for players to keep track of them. How will the trade be executed? Now to the difference between a system of barter and a monetary system. In a game environment like the one in Pokémon GO, it’s possible to design the rules for interaction between people in a way that you simply can’t do in the real world. Even though governments in most economies have a big influence over the monetary systems, there is no need of a central planner for money to establish in a society. Money as a concept evolved by itself and even if a government tried to forbid the use of money, they wouldn’t be very successful. Money is simply an item that holds value because other people accept it as payment. In a game like Pokémon GO, the game developer however could possibly be somewhat successful in preventing money to establish. Or they can effectively control what can be bought and what can’t be bought with money. Government try this with a lot of commodities, but often do a poor job at it, that’s when black markets establish. Earlier in my text I mentioned that there is a currency in pokémon GO, “pokécoins”. This could very well be the currency for which one buys and sells pokémons or pokémon candy, but not necessarily. Niantic could create separated currency systems for different kinds of commodities if they wish. In the real world, people would want to exchange currencies and before you know it an exchange rate would exist. If Niantic want’s to make the trading in Pokémon GO similar to the way it’s done in earlier games, well then we should anticipate a system of barter, as in no money. That means that to be able to engage in trade you not only have to find someone that has the pokémon you want, and someone that want’s the pokémon you have. They will have to be the same person. That will have the effect that you will have to spend a lot of time searching for someone to trade with. As a result, less trade will executed than otherwise would. Another result is that prices would be more difficult to understand, since there is no single unit in which people can measure the price of say one snorlax candy. It could be expressed as x pikachu candy, or y psyduck candy etc. Of course people might start to use a certain candy, let’s say pidgey candy, to trade for other candies. Perhaps people start to think of prices in terms of pidgey candy (1 snorlax candy = x pidgey candy, 1 onix candy = y pidgey candy and so on). Suddenly pidgey candy would be established as money. It is of course difficult to predict, but this illustrates that even niantic might not be able to prevent money from being established. I touched on the subject of restricting prices from changing freely earlier. One way to efficiently shut down most trade is to prevent price changes all together. So as that the only way to trade pikachu with ekans is one to one, or some other arbitrary chosen price. So, even if someone would be willing to sell 5 ekans candy for one pikachu candy, and someone willing to sell 1 pikachu candy for 5 ekans candy. It would not be possible. All of the things I have mentioned as ways to “design” the market is really just different ways to restrict trade, prevent some trades from being made. In the real world trade makes both parties better off if it is voluntary. But in a game like Pokémon GO, it might risk making the game “too easy”. The benefits of introducing a market is to create more interactions between players and encouraging people to develop their own style of gaming, and making it easier for players to pursue their own goals. I hope you’re looking forward to the coming update as much as I am! Can game developers get people to play more and have a better gaming experience by restricting playing? Är det fel att anta att ekonomisk tillväxt leder till ökad välmående? Potternomics part two: What is magic? Drivs med WordPress Design & Developed: philips by Themepoints.